MEENAKSHI TRAVELS RENT-A-CAR based in Vashi, Navi Mumbai, with the sole purpose of providing quality service at reasonable rates. We have our own fleet of fine quality Air-conditioned rental cars comprising of Ford Ikon, Innova, Indigo, Indica, Honda City, Toyota Qualis, Accord and many others. We also have TEMPO TRAVELLER (17+1 Seater Video Coach – Non A/c.) available for corporates group booking on monthly basis. 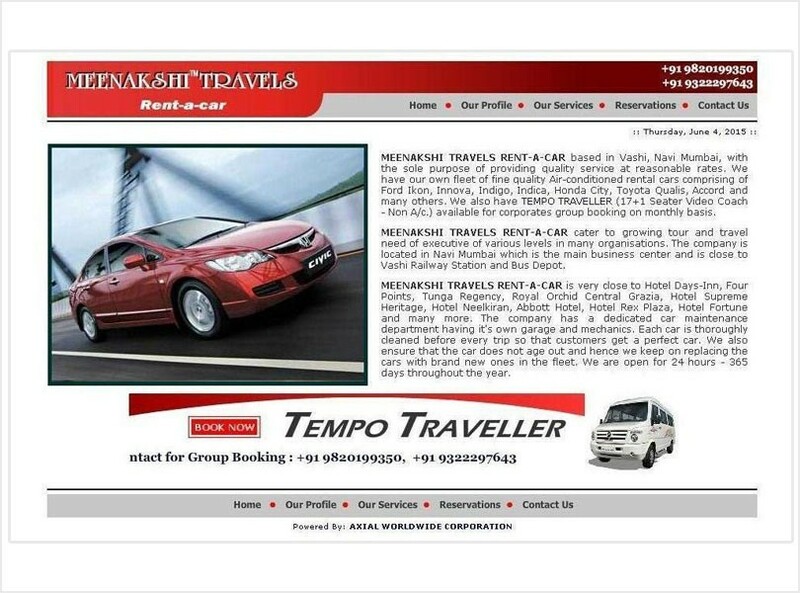 MEENAKSHI TRAVELS RENT-A-CAR cater to growing tour and travel need of executive of various levels in many organisations. The company is located in Navi Mumbai which is the main business center and is close to Vashi Railway Station and Bus Depot. MEENAKSHI TRAVELS RENT-A-CAR is very close to Hotel Days-Inn, Four Points, Tunga Regency, Royal Orchid Central Grazia, Hotel Supreme Heritage, Hotel Neelkiran, Abbott Hotel, Hotel Rex Plaza, Hotel Fortune and many more. The company has a dedicated car maintenance department having it’s own garage and mechanics. Each car is thoroughly cleaned before every trip so that customers get a perfect car. We also ensure that the car does not age out and hence we keep on replacing the cars with brand new ones in the fleet. We are open for 24 hours – 365 days throughout the year. MEENAKSHI TRAVELS RENT-A-CAR based in Vashi, Navi Mumbai, with the sole purpose of providing quality service at reasonable rates.